SUMMER. Time to slow down, enjoy simple pleasures, and take the time to connect with others. (And yes, eating gelato is a worthy summer pursuit, too.) Our new summer stationery items may tempt you to take pen in hand—and your note in the mailbox will make their day! 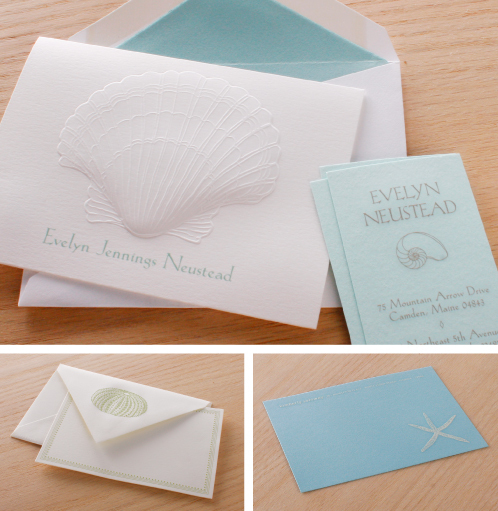 Personalize these embossed correspondence cards here. THE FUTURE IS BRIGHT. Dearest offspring: We know you wouldn’t dream of not sending thank you notes for those nice graduation gifts you received, and after school and job interviews. (Well, your moms wouldn’t dream of it, anyway.) Smart tip: Always write a hand-written thank you note within two weeks. You’ll stand out as the brightest of the bunch, and the most thoughtful. Love, Moms everywhere. 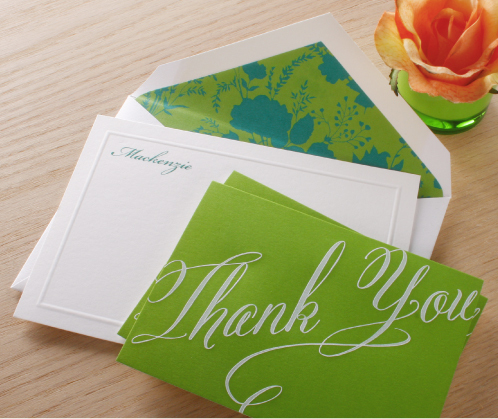 Vivid Green Calligraphic Thank You Notes (shown above). THE 3 R’s OF SUMMER: Relax, Reflect, Reconnect. A glass of iced tea, a comfy chair on the porch, and finally the time to write those notes to family and friends. Our floral notes Embossed Green Quince Notes, Embossed Anemone Pink Notes (left) and Engraved Watercolor Roses Notes (right) are a garden of delights. LUCKY, POPULAR YOU: One reason you get invited to all those summer events must be because you write such lovely thank you notes (that and your charm, of course). 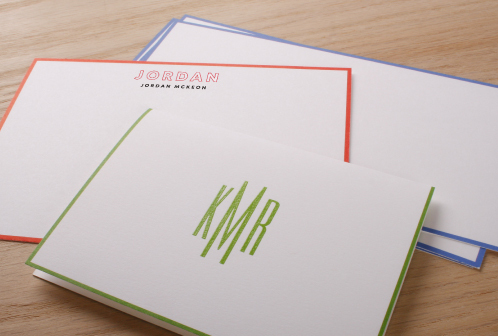 See how your custom monogram looks on our Marine Bordered Cards, Vivid Green Bordered Notes, or Hibiscus Bordered Cards.